The specialist supplier to the automotive, medical and building products sectors will install the 300 ton ZANI Motion Master press in June and is hoping that the speed and additional bed size will unlock larger pressings and stampings opportunities. “We have worked with Bruderer UK for more than 20 years and have been extremely impressed with the quality of the machines it provides and the service/maintenance packages it delivers,” explained Ian Davies, Sales Director at Clamason Industries. The order from Clamason Industries delivers a perfect birthday present for Bruderer, which celebrates 50 year of business in the UK in 2018 and 75 years in its native home of Switzerland. 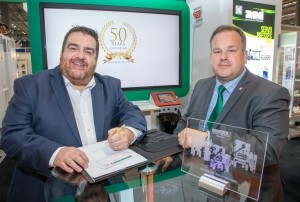 It marks a major period of growth that will see the firm, who has bases in Luton and the Black Country, smash £5m for the first time in its history and recruit a further three skilled sales and service engineers. UK MD Adrian Haller signed the agreement at MACH 2018: “We knew we were close to a deal, but never expected to secure it at the event, so this is an extra special birthday present for us. “We listened to the technical team at Clamason and, through our understanding of the business and its objectives, we put together a turnkey package that not only met its requirements, but actually surpassed them. Bruderer UK also used its appearance at MACH 2018 to launch its ‘Rising Stars of Engineering’ competition, which is open to all engineers or manufacturing professionals under the age of 30. Designed to support the ‘Year of Engineering’, the initiative is inviting initial written nominations, with the shortlisted nominees asked to produce their own video detailing why they should win and the outstanding achievements they’ve made over the course of the year. Three winners will be announced in December and will be taken on to a two-day trip to Bruderer’s world class manufacturing facilities in Frasnacht in Switzerland, where they will tour the factory, meet engineering experts and enjoy a celebration dinner. Adrian concluded: “Our recent growth has created its own issues and we are struggling to find young people that will join our team. Rather than bemoan our bad luck, we wanted to take measures into our own hands and believe this competition – along with our continued support of local technical academies – will help raise engineering’s profile as a great career choice. 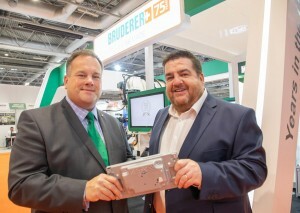 Bruderer UK is on Stand H20-330 at MACH, providing live demonstrations of its BSTA 510-125B2 press, fitted with BPG22 planetary gearbox and state-of-the-art BSV300 servo feeder.